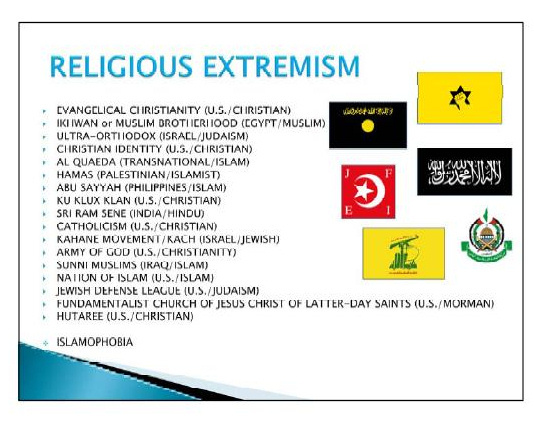 This entry was posted in Our Government at Work, Political and tagged Al-Qaeda, Christianity, Evangelicalism, Hamas, Ku Klux Klan, Muslim Brotherhood, Nation of Islam, United States, United States Armed Forces. Bookmark the permalink. agnostic guy here, no religion is innocent, including mine. crazy people will do crazy things in support of their beliefs, there’s just a large amount of people who identify themselves as evangelicals that ARE doing crazy things on US soil. if you’re peacefully practicing your religion i fail to see how this should be considered an insult to you, you’re not a religious extremist and therefore aren’t being treated as such. don’t take it personally guys, the way this is being publicized is clearly meant to make Christians feel insulted and to depict imminent persecution. i don’t think that’s what’s really happening here, more likely they were briefing on all kinds of religious extremists found in the area and believe it or not christian extremists do very much exist. that’s not a slap in the face to the rest of you, if you don’t like that then take a look at the people that brought the military’s attention to your set of beliefs. there’s nothing wrong with peacefully practicing any religion so long as you don’t try to force it on others but some people (from pretty much every religion in history) are incapable of accepting that some people don’t agree with them. basically if everyone could just practice peacefully and respect the beliefs of others, even if they disagree with them, we would never have a conflict like this. but not everyone can, as proven time and time again. for that reason i’m a strong believer that religion in general does more harm than good. believe what you want, just respect that other people may believe something different. every group has it’s bad seeds, it was the military’s job that day to identify some of the one’s they might encounter. I wish that true Christianity was a #1 force to be reckoned with in your country and mine and across the world . . . in a spiritual sense, that is. “Onward Christian Soldiers” is no longer heard. Oh to be known as such again! Thanks for sharing.If you do not mind I am going to reblog this post. Amen to your prayers Susan. Usually I refrain from getting wrapped up in these perpetration’s, but it seems there is some legitimacy here. My point, regardless and however, remains equally valid, “This ain’t your Grandpa’s America anymore.” I think the driving purpose behind making this news readable to everyone is telling of just how different it is. As in every generation, Jesus’ body is called to be Him here functioning with His mind and instruction. We’ll all be accountable for our choices, but I’m reminded of Augustine’s defense of Christianity when Rome laid its downfall on the faith’s doorstep. “Real Christians are the best citizens any “good” government could want.” If this report is true, then we have to take a closer look at that term “good.” Blessings friend… thanks for the prayers! Honestly I find this hard to believe. But, with that said, I have a non-christian student who works in Homeland Security. I asked him the other day why they were buying up so much ammunition. He looked me straight in the eyes, with a very serious look and said, “In case there is an uprising here” I don’t know if he really knows the reason, but he certianly believed it. I think people who lump themselves in with the evangelical community are probably one of the largest and most legally armed demographic groups in the country. If there was an uprising I believe it would start with “us”, at least at the fringes of our community. We believe in God, Country and the Constitution, and there are a LOT of us out there who are heavily armed AND upset. The government knows this. IMHO that is why there is such a big push for more gun control. Hi Jim. Very valid point. I also heard of this purpose by Homeland Security. The day may be approaching sooner than thought that we may really be able to physically “experience the fellowship of His suffering” right here on our own soil. Having said that, I want to admit that I’m not positive of the validity of any of these reports. There’s motivating spirits on both sides of the equation. Blessings friend. Hi Mike I’m sure like me and other Christians your not surprised, Jesus tells us we will be hated if we follow Him and that in the end times before the First Sickle or the Rapture as we call it today, many Christians will be Martyred and what you have shared is the start. Later as Jesus also said, some of us will be jailed and accused of treason and then killed, as Revelation tells us this will be because we will not worship the Beast who will be empowered by Satan, this will be considered Treason , this person will be well known and in a position of importance and power, it will be reported he died and came back to life, he will be hailed as a Christ and will deceive many with his counterfeit miracles, signs and wonders. Already the lazar for the mark of the Beast is being tested, Jesus tells us to look for the signs so we will be prepared but not to fear because He will be with us in Spirit and then come for us in Person and take us to Heaven to join those who were Martyred. 1 Thessalonians 5 2- 6 For yourselves know perfectly that the day of the Lord so cometh as a thief in the night. For when they shall say, Peace and safety; then sudden destruction cometh upon them, as travail upon a woman with child; and they shall not escape. But ye, brethren, are not in darkness, that day should overtake you as a thief. Ye are all the children of light, and the children of the day: we are not of the night, nor of darkness. Therefore let us not sleep, as do others; but let us watch and be sober. God bless you Mike and your Loved ones greatly.